The constant surprise of Hilton Head Island is the sheer number of remarkable discoveries tucked into so many corners. It seems that just off the beaten path is something simply wonderful. Teague’s Fine Men’s Clothing is that kind of surprising and wonderful place. Located in the Village at Wexford, Teague’s is squeezed up against a Subway restaurant, but inside it’s a completely different world. If you want to feel like a real guy with some class, Teague’s is the place to go. It’s a place where you can feel good as a guy’s guy, talking the stock market, what’s new (or wrong) with Tiger’s swing or even confess that you watched the royal wedding in real time, with no fear of recrimination. As soon as you walk through the door, you’re in the thick environment of manliness—only the very best fragrantly starched fabrics, the finest soaps, the richest leathers. It’s what you might imagine it’s like to be all gussied up, in the driver’s seat of the most expensive Ferrari or Lamborghini, surrounded by shiny wood accents and an oh-so-fine leather interior. Do you think you’d be wearing beat up shorts and a ratty old T-shirt and smell like you just finished mowing the lawn? Of course not. You would look and smell like you just walked out of Teague’s. Gary Reavis, Hilton Head Island resident since 1971, is proprietor of Teague’s and has been since it opened 19 years ago. Only classy stores like Teague’s have proprietors. Never stuffy or pretentious, Reavis is welcoming, attentive, knowledgeable and helpful to his customers. He seems to know instinctively that his specialty men’s store needs to feel right, look right and smell right for what it is. It’s all about guys. Women shop there, yes, but they shop for their guys. A men’s specialty store is one of the few real guy sanctuaries left, and it’s not for everyone. Reavis clearly understands that. He’s been in this business since right after college, coming here with a couple of buddies to set up a store similar to Brittons on Devine in Columbia, where he learned the men’s specialty store craft. They helped to create Knickers, which has had a presence on the island for 40 years. Knickers was tourist focused—busiest in the late spring, summer and early fall. 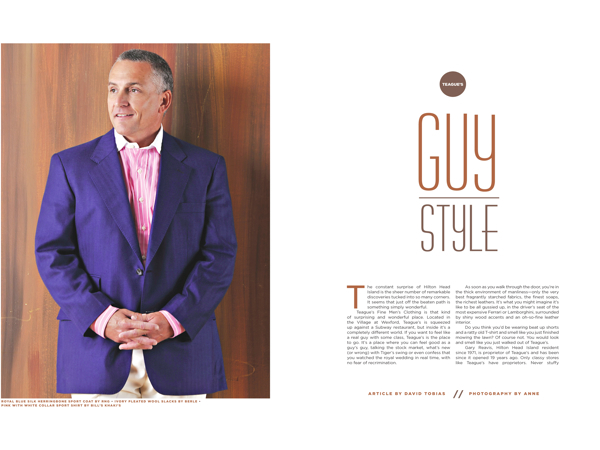 When Ron Teague arrived from Knoxville in 1992, his intention was to create a store that catered to island residents. It would do the bulk of its business in the late fall, winter and early spring. He was looking for a manager who knew the business and the island. Reavis, who by then had extensive buying experience in high-end menswear, having bought for affiliated Knickers stores at the Greenbrier in White Sulfur Springs, in Boca Raton, Sawgrass and Charleston, was the perfect guy for the job. 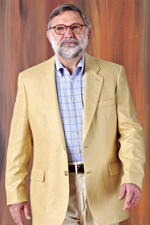 In fact, it didn’t take long for Teague, an international buyer for Siemens Corporation, to realize that Reavis knew far more than he did about the business of menswear, and the logical next step was to put Reavis in charge. 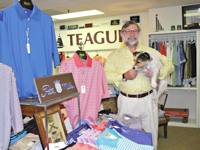 Reavis eventually purchased Teauge’s, and has found a niche for Teague’s which appeals typically to a guy who has retired, perhaps even retired early, probably plays a lot of golf and probably has the wherewithal to buy better quality clothing. And there’s also a younger generation version: the fraternity guys who wear colorful sport coats, quality Polos and madras shorts—the Carolina Cup crowd. Lou Zeller, from Philadelphia, retired and a resident of Moss Creek, is fairly typical. On a lovely day in May, Zeller walked into Teague’s, mostly just to hang around and take in some of the ambiance. He’s a regular customer, formerly in the hat business, who knows quality. Setting Teague’s apart from the competition is not Reavis’ primary focus. He’s mostly content with his unique slice of the market. He acknowledges that the clothing business, in general, has changed to accommodate a higher concentration of the buying public that increasingly cares more about price than quality. His, however, is a completely different selling scenario. Getting the word out on new styles and new lines is a bit of a throwback to the way clothing was sold years ago. So is the store’s subdued music playing in the background, which trends to easy listening, ’60s style (Linda Ronstadt, Bob Dylan, etc.—all part of the mood). Teague’s hosts two or three trunk shows each year, when representative from various lines bring in their current merchandise as well as all the items for next season. Reavis typically provides a discount during a show, and the customer doesn’t have to pay for what he selects until the items come in. It’s a clubby way of doing business. Trunk shows are open to the public, of course, but Reavis communicates news to his best customers in e-mails, letters and even phone calls, letting them know that lines they are partial to are going to be shown and that it would be a good time to come in. Still, some guys refuse to come in the store, no matter what. They prefer to buy their clothing at Teague’s but send their wives in to do the detail work. For those guys and more, Teague’s is the perfect retreat.